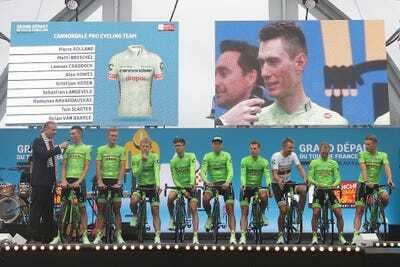 The American pro cycling team Cannondale-Drapac, currently competing in the Tour de France, announced on Friday that it is teaming up with the Verizon-owned company Oath as its digital-media partner for the 2018 racing season. It’s another nice win for Cannondale-Drapac. The US-registered team has been looking increase its budget so that it can be more competitive against the world’s top teams, including that of defending Tour champion Chris Froome’s Team Sky. Cannondale-Drapac general manager Jonathan Vaughters has up to now led his team with what he’s referred to as a “Moneyball” strategy, in reference to the baseball bestseller. Cannondale-Drapac has an annual budget of about $US15 million, about one-third of Team Sky. After Verizon completed its acquisition of Yahoo in June, it merged Yahoo and AOL, naming the new subsidiary Oath. Oath’s portfolio of 50 media and technology brands include HuffPost, Yahoo Sports, AOL.com, Tumblr, Yahoo Finance, and Yahoo Mail. As previously reported, by 2020, Oath said it wanted its brands to reach 2 billion consumers and pull in up to $US2o billion in revenue. Cannondale-Drapac is owned by the sports-management holding company Slipstream Sports, which is owned by New York-based private investor Doug Ellis. Cannondale-Drapac is enjoying its best Tour in years. As of Friday morning, it had the race’s third-placed rider, Rigoberto Urán of Colombia, who looks poised to stand on the final podium in Paris when the race finishes Sunday. Urán won one of this Tour’s hardest and most dramatic stages, the ninth, in Chambery. The squad had a standout start to the Tour with Americans Taylor Phinney and Nathan Brown each donning the polka-dot jersey after leading the “king of the mountains” competition. But the US-registered team has been looking increase its budget so that it can be more competitive. Its manager, Jonathan Vaughters, had led his team with what he’s referred to as a “Moneyball” strategy, in reference to the baseball bestseller. Cannondale-Drapac has an annual budget of about $US15 million, about one-third of defending Tour champion Chris Froome’s Team Sky. This story is being updated. Click here to refresh this page. Slipstream Sports has partnered with Oath, a digital media company of more than 50 media and technology brands, including HuffPost, Yahoo Sports, Tumblr, Engadget, Autoblog, and AOL.com. Oath will have its brand on team racing kits and vehicles as the Cannondale-Drapac team races over 240 days, across four continents, in the 2018 season. Additionally, Oath and Slipstream will collaborate in creating and distributing exclusive video content and experiences from inside the world of professional cycling. Through this partnership with Oath, Slipstream Sports, which manages the Cannondale-Drapac Pro Cycling Team, has the potential to reach over one billion consumers globally. Professional cycling is one of the fastest growing sports globally with more than 3.5 billion cumulative global TV viewers watching the World Tour in 190 countries. Slipstream and Oath will begin sharing cycling content beginning January 1, 2018. For more on Oath, visit www.oath.com. The Cannondale-Drapac Professional Cycling Team is an American-registered UCI World Tour racing team. It competes at the highest level of the sport and strives to be open, attacking, and entertaining. In the 2017 season, it has the youngest roster and one of the most diverse squads in the World Tour. Our riders come from the United States, Canada, Australia, The Netherlands, Italy, France, Colombia and beyond. For more on Slipstream, visit www.slipstreamsports.com. Oath, a subsidiary of Verizon, is a values-led company committed to building brands people love. We reach over one billion people around the world with a dynamic house of 50+ media and technology brands. A global leader in digital and mobile, Oath is shaping the future of media. For more on Oath, visit www.oath.com.